While guarding an ammunition depot near a freight train a military guard observed a strange figure about 1.20 meters in height, black in color that was moving over the train tracks in a very quick and agile manner. Two guards approached the figure and pointed their rifles at it and it suddenly turned around and stared at the two men with two large bright red glowing eyes, it jumped up into the darkness and disappeared. Other soldiers at the base had seen a similar figure around the same time and strange objects over the area had also been reported. One night, in the same base a soldier was given the task to guard a metallic cage, which contained a weird reptilian creature that emitted strange, grunting sounds. One night while standing duty a dark helicopter landed and three military personnel exited the craft, these proceeded to pick up the cage with the humanoid and left immediately. The guard described the humanoid as resembling a “reptilian penguin” with strong jaws and claws. It was about 40 cm in height. The guard observed that the helicopter lacked any identifiable markings on it. Local residents living next to the Tocopilla hills were suddenly awaken by strange loud noises. At first they thought it was a person climbing the hill, but after observing it in greater detail, they realized that, whatever they were seeing, not only was not human; it was something they have never seen before. It was a creature that was climbing the hill very rapidly despite the seventy to eighty degrees steep. They described the being as very agile and fast, making reptilian like movements like a small lizard. The creature appeared to be much bigger than a condor, brown in color, with bright red eyes and what appeared to be feathers throughout its body. It emitted loud quack like noises that were heard every night for a couple of weeks, causing dogs to bark and howl at night. The witness who for the past two to three months had been followed by three strange men wearing black suits, was standing in front of his house one night when a car drove up and the door opened. The witness apparently lost his will and was compelled to enter the vehicle; inside the same three men he had been trying to hide from met him. They drove around for a while until they reached a wooded area outside the city. They stopped the car near a large hovering object that was encircled by a luminous ring. The witness and the three men then walked underneath the object and were hit by a beam of light. He suddenly found himself inside the object, sitting on a chair. Suddenly handles appeared on the chair that secured his wrists and an iron bar pressed his forehead backwards while another gadget held his neck. 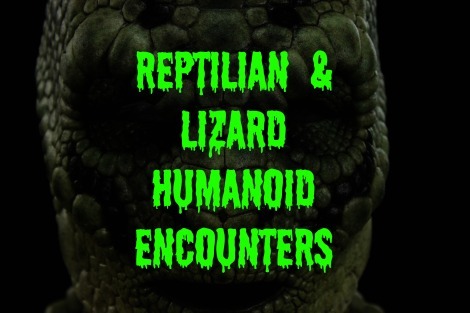 The three men then appeared and suddenly seemed to shed their skin or bodies and transformed themselves into green scaly reptilian like creatures with heart shaped heads. The beings interrogated the witness and spoke of upcoming global events. At one point a door in the room was opened and he was able to see human corpses hanging by their feet from hooks on the walls. Everything went blank after that and his next conscious memory was of standing next to a theater near his home. Eva Trent had fallen asleep when she awoke to a buzzing sound. Opening her eyes she was horrified to find two strange creatures standing on either side of her bed. The entity to her right was about 7-8-feet tall, weighed about 300 pounds, had apparently no clothing and seemed to have either crocodile or snake type skin. The creature to her left was identical in appearance but smaller in height and weight. They seemed to be communicating in a chirping manner. Each of the entities eyes glowed. Eva quickly discovered that she was unable to move. As she stared at the two creatures she found that either one or both were giving her instructions telepathically. The nature of this was seemingly for her to create mentally visual scenes of various kinds and then “they” proceeded to distort that particular pleasant scene in a perverse manner. Apparently the creatures were intent not only to observe her emotional reaction, but also possibly to feed off the energy that was produced. After awhile Eva began to mentally resist the mind manipulation and began to pray earnestly. A short time later she fell back to sleep. The next morning the witness found 5 of her music tapes grossly distorted as if extreme heat had been applied. However no evidence of fire or odor was present. I used to stand outside at night in the country and look up at the stars, basically at the starships, and call to the Lighted Beings to communicate with me. My deep interest in extraterrestrials was exceeded by Shawn's own. Then he told me something that shocked me, and I had never, at that time, heard of anything quite like it! He said that he had been abducted many times, but was on a friendly basis with the reptilian race. Now let me tell you, Shawn had amazing artistic skill and he drew them for me...my skin crawls thinking about it. I WAS ATTACKED BY A REPTILIAN! I awoke one night in a state of which I can only explain as a spasm, my body was in a rigid state. I could not move a muscle and felt like something was on top of me. I fought to get movement back in my body. I could not turn my head or move at all. It was like I was having a fight to get control of my body. After a few panic stricken moments, I could just barely move my fingers, only a little bit. I then felt that there was more than just a spasm. I felt dirty and touched. It was a horrible feeling from deep inside me. I could barely move my toes, again very slightly. My throat felt like it was being held. I could feel something was on top of me. My hands where by my side, but it felt like they were around my own throat, holding tightly. I was using all my might to break free from this spasmodic state. Then could feel something breathing into my left ear, a sound of a growl-like noise right next to my ear. I struggled to move my head to the left, like breaking free from a strangle hold. I could barely see the outline of a head, a big long head next to my own face. As the spasm-like feeling started to wear off, a tiny bit at a time, I could work out that this thing on top of me looked like a lizard/newt thing. It was like a blending together of all that was around it, or maybe invisible. I'm not very sure which, but I could see it clearly as the seconds passed on. It was reptilian. I growled at it, or I think I did. My mind and my body gave all it could to do so. I bared my teeth at it and I could feel it could read my mind. I was swearing at it and shouting all sorts of obscenities at it. I felt violated and used. The next thing, it was quickly off of me and was standing to one side of the bottom of my bunk bed. A light came through the thin gap in the curtains. There were different shades of a golden light which also had very small particles inside it, like dust or small stars which moved around like little bright lights. This reptilian creature was about 6 feet tall. I could sense it was either proud or happy with itself, maybe both. I tried to sit up as best I could and through my mind I swore at it again. The creature walked forward and stepped into the light beam. As it did, the feet and legs vanished into the light. The more the creature moved forward towards the window, the more of it vanished. After it was gone I felt relaxed, but I could still feel where I was held around my throat. I felt I was raped by this horrendous monster. I awoke to a bright sunny day. I could hear my mother downstairs, washing up and doing housework. I laid in my bed and didn't move a muscle. I ran the incident through my mind again and, yes, I could still feel where I was held around my throat. I know this happened. My mind, heart and soul knows that this happened. For the life of me, I could not run downstairs to explain to my mother about this. Who would have believed it? How would my parents have handled such a thing? I did not know what to do? Since that night, my stepfather passed away. I asked my mother if she believed in aliens or ufo's. She replied that my stepfather said once that he saw a ufo near Brighton while at sea in the 1960's and he swore that it was a ufo, but only told my mother this. I never told my mother about my experience, as I thought it would be to harrowing for her to hear.